The signs have been appearing for long enough to know that the end of days is coming. Great leaders and gods have been dying, natural disasters are occurring at an alarming rate, and soon the land will sink below the sea. However, first, there will be a battle for all the glory. Viking clans will clash and win a blood-drenched victory or enter the halls of Valhalla. The Blood Rage Digital Kickstarter is now live. Featuring incredible graphic, an intuitive interface, and a scalable AI, Vikings of all skill levels will be able to lead their clans into battle for glory! Blood Rage Digital also gives backers the opportunity to acquire some incredible, highly-detailed miniature figures for use with their analog Blood Rage tabletop game. Four alternate-sculpt Monsters from the original Blood Rage Kickstarter join the battle, including the Wolfwoman, the Mountain Giantess, the Seer Troll, and Garm, the canine guardian of the gates of Hel. There is also an all-new group of warriors joining the fray. The Stag Clan feature a Leader, a Mystic, and two different Warrior sculpts. The Stag Clan includes all the necessary tokens and the cards needed to add a fifth player to your board games. 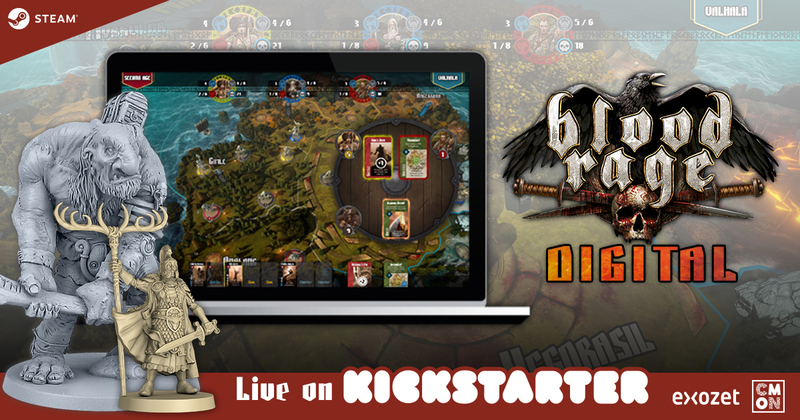 Follow the Blood Rage Digital Kickstarter page for all the latest updates and make a pledge. Glorious victory or glorious death awaits!